Erica Connelly was a gymnast at Indiana University of Pennsylvania. Trying to reach my friend Erica Connelly during the summer tends to go something like this. "Home?" I'll text her. And then a few hours or a day later, I'll get a short reply back. "On Rim Fire." Or, "Just left for Desatoya." Or, "Got called out to Idaho." A former collegiate gymnast at Indiana University of Pennsylvania, Erica, who turned 40 this week, still looks the part -- compact and ripped at 5-foot-2 and 120 pounds. 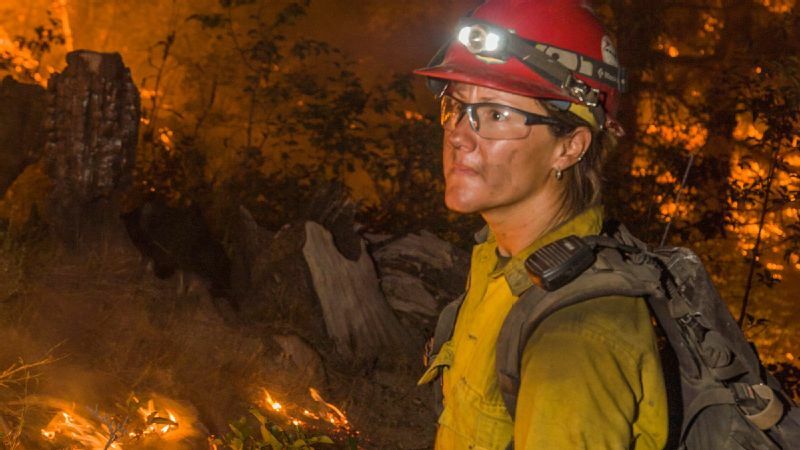 For the last 13 years, she has worked as a wildland firefighter, pulling duty on engine crews, on helicopters, as a member of an elite hotshot squad, and now as a fire specialist based in Fairbanks, Alaska. "I was very, very competitive, even as a child," she once told me, trying to explain how she has succeeded in this male-dominated profession. "I wanted to win everything. I mean, everything." During wildfire season, which runs roughly from April to October, Erica said she expects to attend 20-plus fires. Her schedule doesn't show any signs of slowing down, either. In 2015, more than 10 million acres burned across the country -- one of the worst wildfire years on record. Already in 2016, wildfires have ravaged 4,057,474 acres nationally (through Thursday), with Washington and Alaska being affected the most, according to the National Interagency Fire Center. In California, where I live, fires have claimed several lives and destroyed hundreds of homes since the beginning of the year. Currently there are seven large fires burning 140,276 acres across the state. On the Blue Cut fire in San Bernardino County alone, an estimated 34,500 homes and 82,640 people have been affected by the evacuation warnings. I've known Erica since 2008, and I've always admired her career. We've talked at length about it, and I even visited her on assignment in 2014 to take photos of her and her crew. Erica was one of three squad bosses on the Black Mountain crew in Carson City, Nevada, and was responsible for a team of six male hotshots. "Hotshots are always ahead of everyone else, they are at the apex of the fire -- they go to the hardest part," she said then. "It's a rush when we are about to tie something in -- you're tying in the line on the fire and everyone is moving and you hear all the tools going -- I love that part." With all the recent news of wildfires across the West, my thoughts return to my friend and how she's turned the lessons she learned in sports into an adventurous -- and important -- career. Here's her journey from gymnast to firefighter. 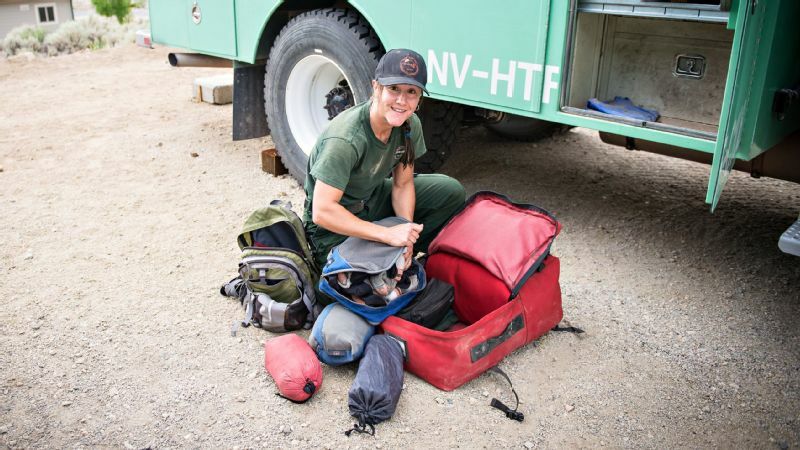 The bag Erica packed to head out on a fire included six quarts of water, two fuel canisters for chainsaws, earplugs, safety glasses, a radio, a lighter, the bracelet of a fellow firefighter who passed away, and a small aluminum tent that deflects heat. Erica said that growing up in Sharon, Pennsylvania, she "was like all little girls who dreamed of going to the Olympics." By 16, she could effortlessly perform combinations like a roundoff back handspring to back layout on a narrow balance beam -- making her a Level 8 gymnast. Erica went on to the Indiana University of Pennsylvania, where she spent four years competing for the Crimson Hawks, a team that consistently won half of their Division II meets. Now, Erica is the friend who throws down roundoff back handsprings at BBQs, and the one who drives to Baja each November to teach herself how to surf. 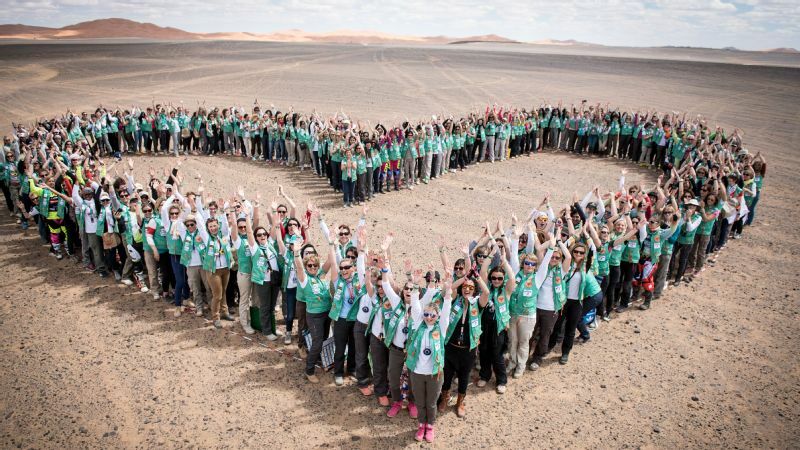 In 2014, Erica was one of two women on the Black Mountain crew. In 2001, Erica, who majored in English with a pre-law minor, worked at a law firm in Denver. "When I left there, I was like, 'Yup, I'll never do that. That's not the life I want to live,'" she said. She wanted to live a life that included being outside and, like in her college days, she wanted to be part of a team. 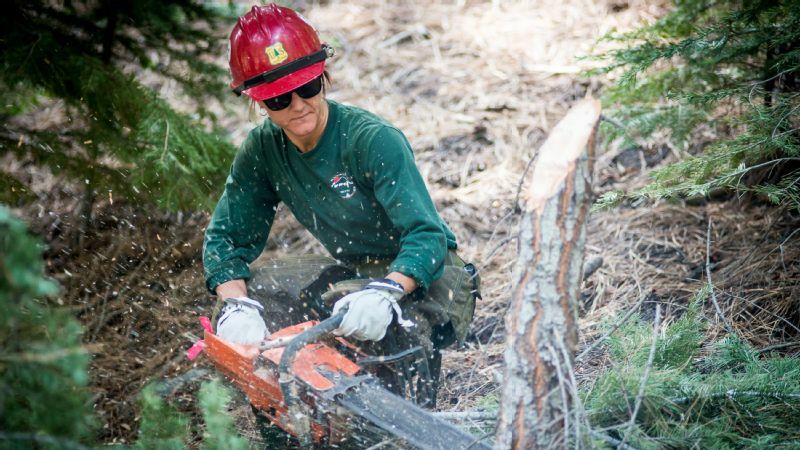 While living in Lake Tahoe, California, she met two local hotshots -- an elite group of wildland firefighters who travel to remote parts of the country to work the apex of the fire. Erica thought it seemed like a great gig. Without hesitation, she asked, "Where do I sign up?" Confident in her athletic abilities, she thought, "I've got this." Only it wasn't that easy. Erica on a fire in Boise National Forest in August 2012. "When I first started I didn't know what I was getting in to," Erica said about becoming a hotshot. "I mean, I knew, but you don't really know. Once you're in it, you don't quit, though. I knew I wanted to be outside, and I like working as a group to get things done. I liked the physical aspect. I've always done well with that. You know how there are some people who like to suffer? And they do sports where they suffer but when they're done they're like, 'I did it'? I guess you could say I was up for the challenge." Erica clears brush in a section of the Humboldt-Toiyabe National Forest in 2014. 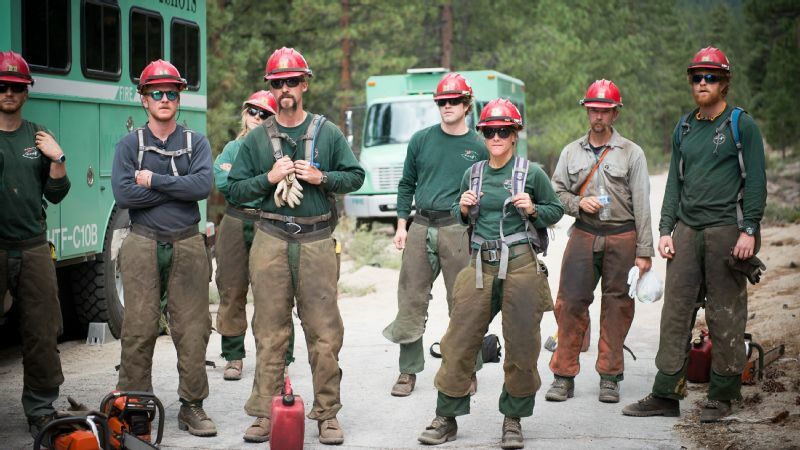 During her first season with the Tahoe Hotshots in 2008, Erica said, "I went with a crew and I had a difficult time keeping up -- the physical level was really high; I kept falling out. It's a mind game. Once you think you can't do it, you can't do it. You fall out one time and you think you're always going to fall out. I would go to bed in tears. I just couldn't keep up. I was disintegrating. I was so skinny." To cope, she had to think back to her days as a gymnast when her coach made her visualize the perfect bar routine. "He would say, 'If you can see it, you can do it.' Or, 'You're not nervous, you're excited.' Eventually you get there." 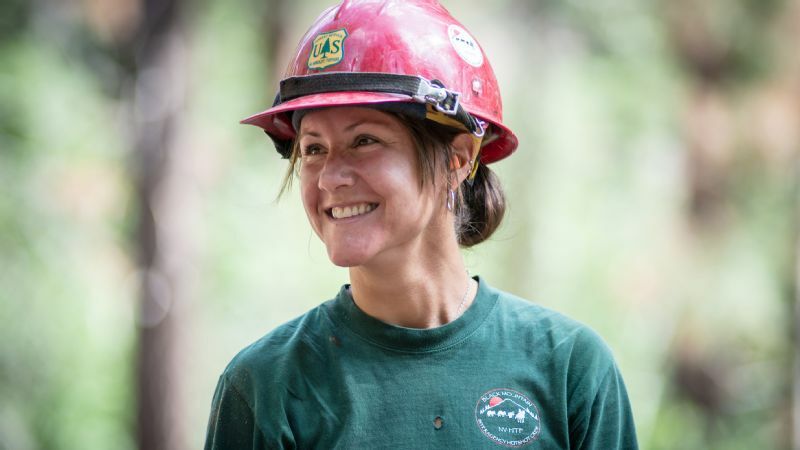 As a hotshot, Erica often worked on a fire from sunrise until 10 p.m.
On a fire, Erica said hotshots will work often work from sunrise until 10 at night. A lot of times, they don't even set up a tent, but throw a Therm-a-Rest down for the night and then get up in the morning and do it all over again. Crews will often be "spiked" out when they're on a fire, which means they sleep and eat away from the main camp for weeks at a time. "Sometimes I'm so tired, I don't even want to take my boots off," Erica said. "For the most part, I just feel really content with the day, like I've done something good. We don't even set alarms. We just get up when the boss man comes around and says 'coffee time.'" When they aren't on a fire, hotshot crews work on preventative fire projects closer to home. Erica went for an early-morning run on one of the crew's down days. Hotshots will often hike single file for 16 miles a day carrying 40-pound packs and chainsaws. In between fires, crews maintain their physical fitness -- an important part of the job. Erica worked as a hotshot for seven years and worked her way up to a squad boss before she took a job with the Alaska Fire Service. 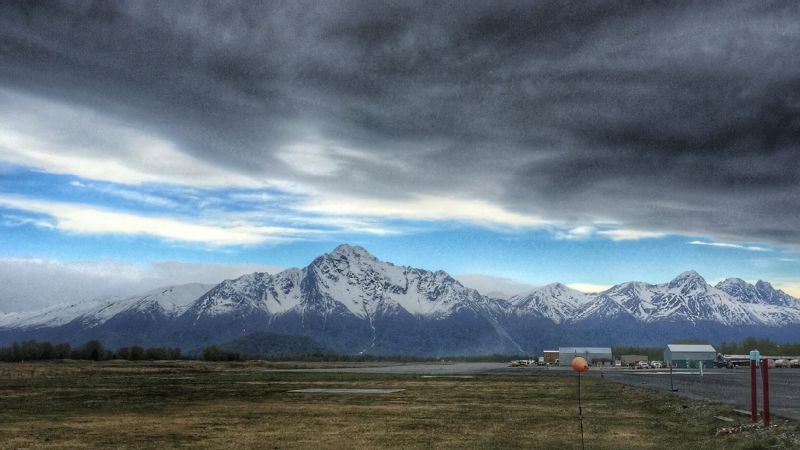 A view from the helipad near Erica's work area in Alaska. Erica has been a fire specialist in Fairbanks since February. In May, she worked 26 days straight. "Fighting fires in Alaska isn't like anywhere else," she said. 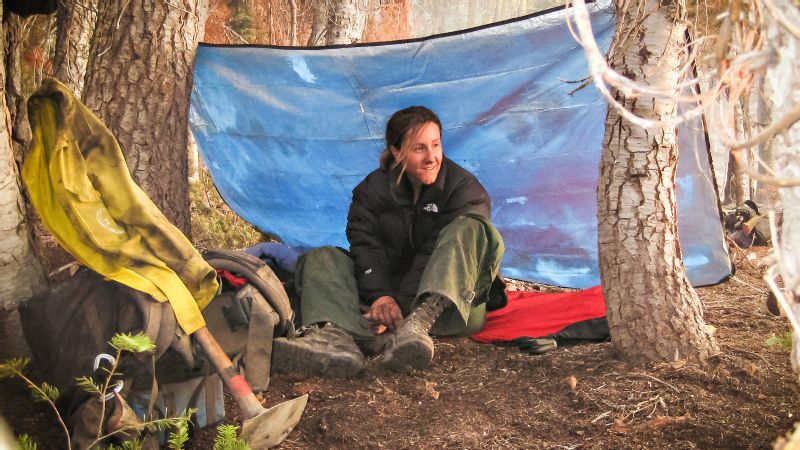 Many of the places her department travels to are so remote that crews take a designated "shooter" with them to ward off grizzly and brown bears. "I like that I go to different places, though," Erica said. "A lot of the fires are far away, and I've been able to see all parts of the country because of them. Sometimes I put my foot down on the ground and I'm like, 'Has anyone every been here before?' And then I'm like, 'Who would ever come here?'"